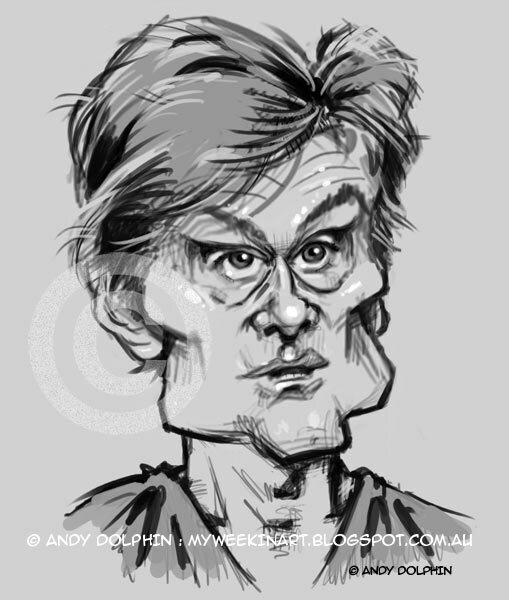 After reading a few recent news reports from the US, I quickly knocked up this preliminary caricature sketch of TV personality and cardiothoracic surgeon, Dr Oz. Nicknamed "America's Doctor", Dr Oz found himself in front of US Senator Claire McCaskill, and facing some heavy questioning about his enthusiastic promotion of "miracle" weight loss products on his show. Video of the doctor's testimony resulted in some "roo in the headlights" moments ("deer in the headlights" moments, if you're in the US. Others can insert their own local variant.) as the much-adored surgeon tried to answer the Senator's questions. Those moments were the inspiration for me to finally caricature Dr Oz, something I've been planning for a while. NOTE: Permission is NOT granted to use this image for any purpose. Sorry.